The Collected Interior: Jones Design Company...guest blogger tommorow! Jones Design Company...guest blogger tommorow! Hey guys, just a reminder that Emily from the Jones Design Company will be our fabulous guest blogger tomorrow instead of today! And in honor of our philosophy of decorating for less and thinking outside the design box...Emily will be sharing a tuturial on how she turned a thrift store cable knit sweater into a cozy pillow! Ahhh, I can't wait! 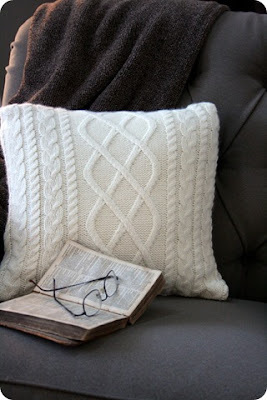 And what a great project for Fall. And don't forget about Frugalicious Friday later tonight or tommorow too! Yup, link up those fabulous finds crafts and Diy projects...cuz we want the scoop on how you find fabulous!